1. My lovely daughter, I can’t express the feelings I had, when for the first time I took you in my arms. Thank you for being my daughter and turning me into a proud mother. Happy birthday, my heart! 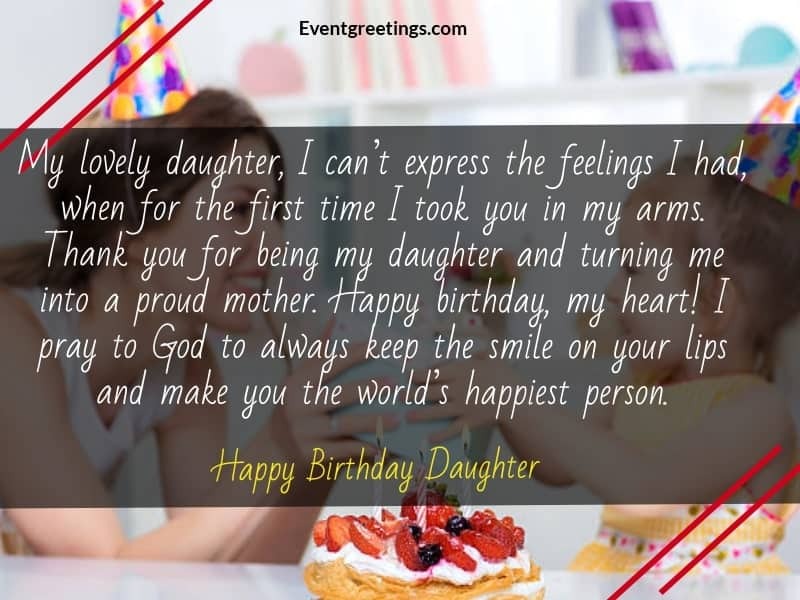 I pray to God to always keep the smile on your lips and make you the world’s happiest person.Happy Birthday Daughter! 2. Your birthday is always a very special day for me. On this day, I became a mother. I wish that every day of your life brings new happiness for you. Have a wonderful birthday, my baby doll! 3. My princess, today you’ve completed another year of your life. Congratulations my dear! You are and always will be my first priority for me and I can do anything for the welfare of your life. Always be happy and my blessings are always with you. 4. Happy birthday my little angel! On this special day, I want you to know that you will always find your mother beside you who will always support you for all your good deeds. Have a blissful life with a lot of happiness. I love you. 5. My baby girl, happy birthday! Your entrance into my life has fulfilled me. Your face gives me the strength to fight against any evil things. Your importance in my life can never be measured. My life, I wish you all the happiness of the whole world. 6. A years ago on this day, I was born as a mother. Thank you, daughter, for coming into my life. May the smile always remain in your face and the happiness never abandoned you. Happy birthday the love of my heart! 7. Every day, I thank God because he blessed me with a lovely daughter like you. Happy birthday, dear! May God always protect you and give you the power to overcome all the obstacles in your life. Love you, dear, enjoy the day. 8. Princess, happy birthday! For me, you were my dream that comes true. Celebrate this day with lots of joy and make an unforgettable memory. Receive my message with a bunch of love and a lot of hug for you. 9. 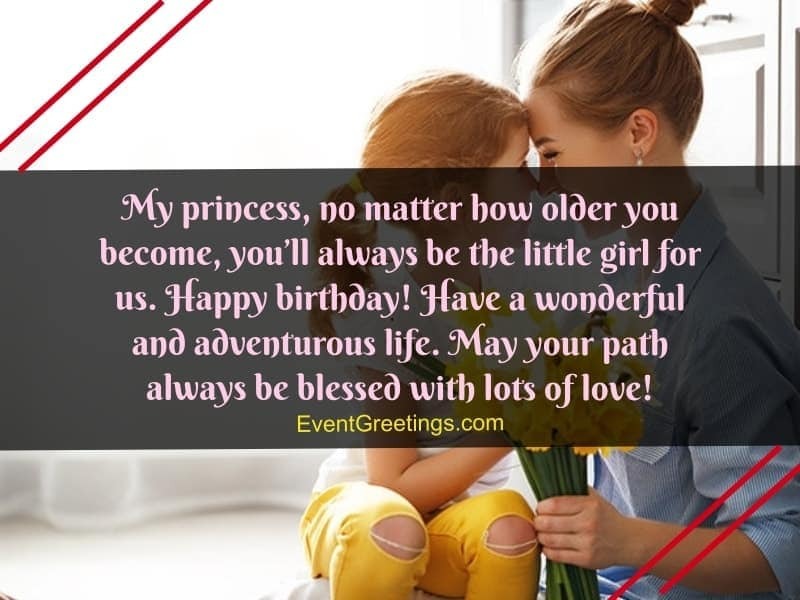 My adorable daughter, I wish you a very happy birthday. You are the most cherished and beautiful girl for me. Have a wonderful day dear. May all your birthday be celebrated with much love! Mom loves you a lot. 10. My beautiful girl, today is a very special day for us. Happy birthday my love! Enjoy every moment of the day without worrying about anything. May your journey of life becomes smooth and stress-free. 11. Happy birthday, dear! No doubt, you’re my lovely daughter and I pray to God to make you a wonderful wife and a proud mother. Have a life full of pleasure and satisfaction. Love you, my child. 12. My princess, no matter how older you become, you’ll always be the little girl for us. Happy birthday! Have a wonderful and adventurous life. May your path always be blessed with lots of love! 13. 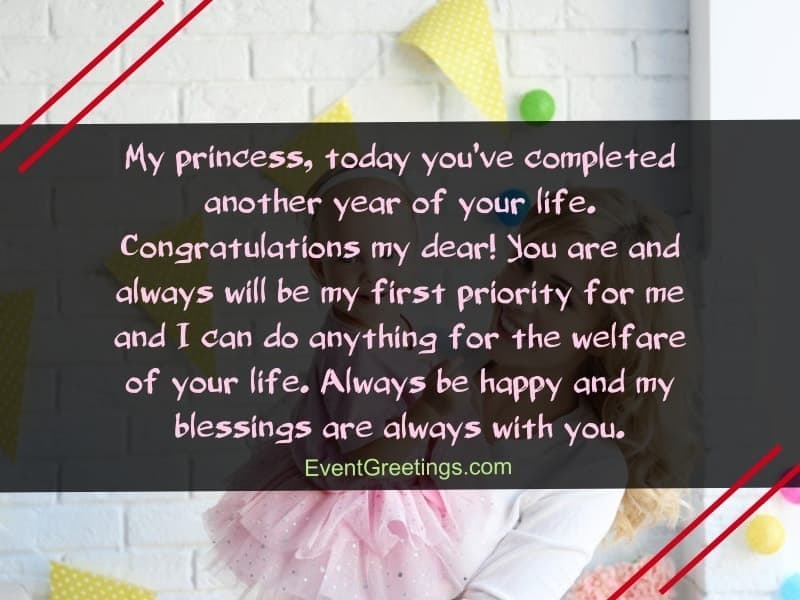 My daughter, on this special day, I want to tell you that, I will always cheer for you in your every success and will appease you if you become failed in your way. Never lose hopes and be happy. Have a wonderful birthday, dear! 14. My daughter, my pride, happy birthday! I cherished for a daughter and luckily I found a friend as well. Thank you for always understanding me. No matter what happens, I’ll never abandon you and will always be by your side. 15. Dear princess, you are a daughter that any parents would like to have. May God make happiness to your daily companion and remove all the sorrows from your life. Have a lovely day, dear! 16. Happy birthday, little girl! The day is all yours. May you start all your day with a smile and keep smiling the whole day. Have a blissful life. 17. Happy 13 birthday, my sweetheart! Today, I want to tell you that, with your nature and behavior, you can make your teen phase either most beautiful or complicated. But always know that I’ll be by your side to protect you and to save you from all the evil touch. Love you. 18. 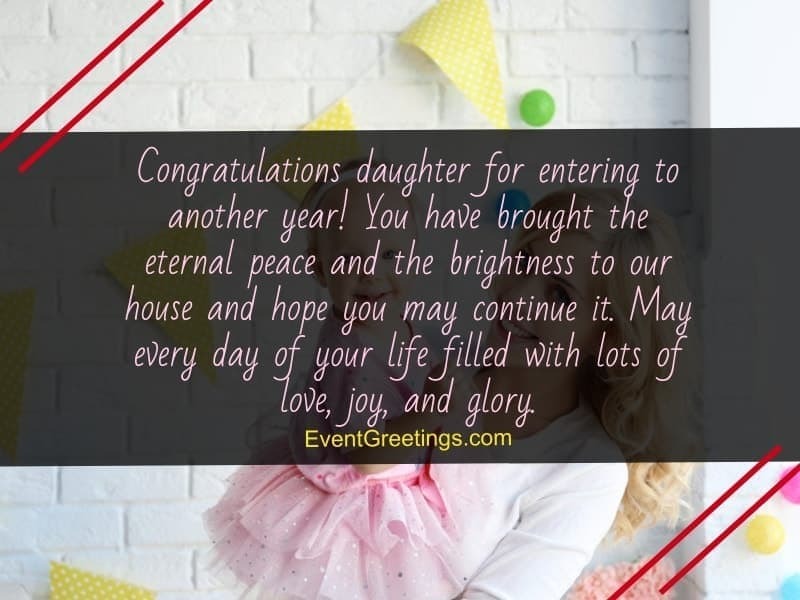 Congratulations daughter for entering to another year! You have brought the eternal peace and the brightness to our house and hope you may continue it. May every day of your life filled with lots of love, joy, and glory. 19. Today is the greatest day for us; it’s your birthday. Happy birthday, my daughter! Your presence gives me the pleasurable peace and happiness. I pray to God to make you a great and successful human being! 20. My dear daughter, you’re my angel and my friend. No relation is as beautiful as ours. Words are too short to express my love for you. Always be blessed, my love. Happy birthday! 21 Happy 1st birthday, my little daughter! You entrance has completed me. I feel that I’m the happiest person in the whole world. Thank you for coming into my life. I promise I’ll not let any sorrows come into your life. 22. Today is the birthday of a very special person of my life. My baby doll, happy birthday! Have an adventurous and enjoyable life. May God turn you into a respected person! My blessings are always with you. 23. My lovely daughter, happy birthday! Thank you for making me feel proud. Always be happy with what you have. May you become a virtuous person! 24. Happy birthday, the most beautiful girl! I pray to God that, every moment, every day and every year of your life may bring new hopes for you. May you become a wonderful human being! 25. 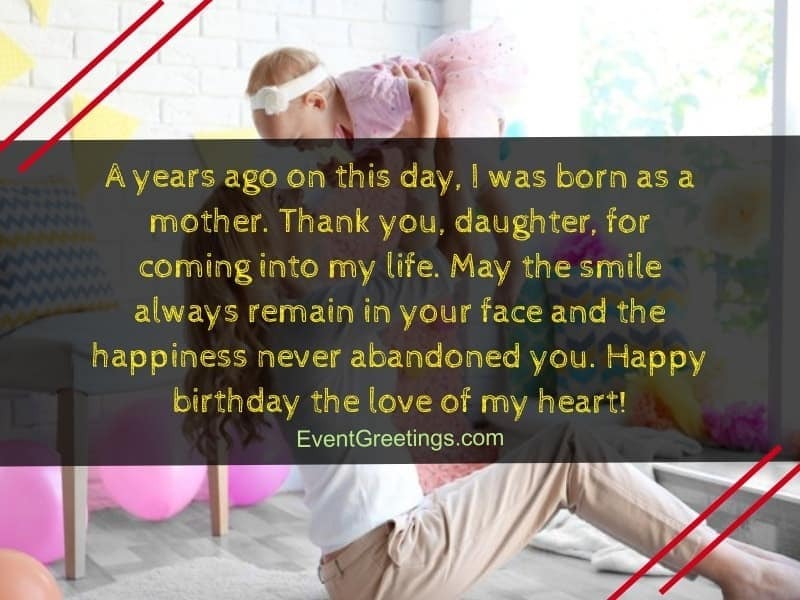 My beautiful daughter, on this special day, I wish you all the love in the whole universe. Always remember the learning your family gives you. You are at the top place of my heart and always will be. May God always keep you happy! 26. Congratulations my daughter for entering the 30th phase! I can’t imagine, 30 years have passed since you born. I’m so happy for your successful life in all way. Thank you for being such a wonderful daughter. God bless you, my child! 27. Another year has passed and one of the most important days has come again. My daughter, may God make you the happiest person! Always keep the gorgeous smile on your face dear. Have a lovely day, my girl. Happy birthday! 28. Times are passing too fast. Today you’ve become 30. Congratulations my child! You’re the most kind-hearted person as God has given you the biggest heart. I’m really proud that you born from my womb. Continue like this. Stay blessed my dear! 29. My child, happy birthday! It’s the happiest day for me and every year I eagerly wait for this day. I wish, your happiness be multiplies every year. Always follow the right path and may you become a noble person. 30. 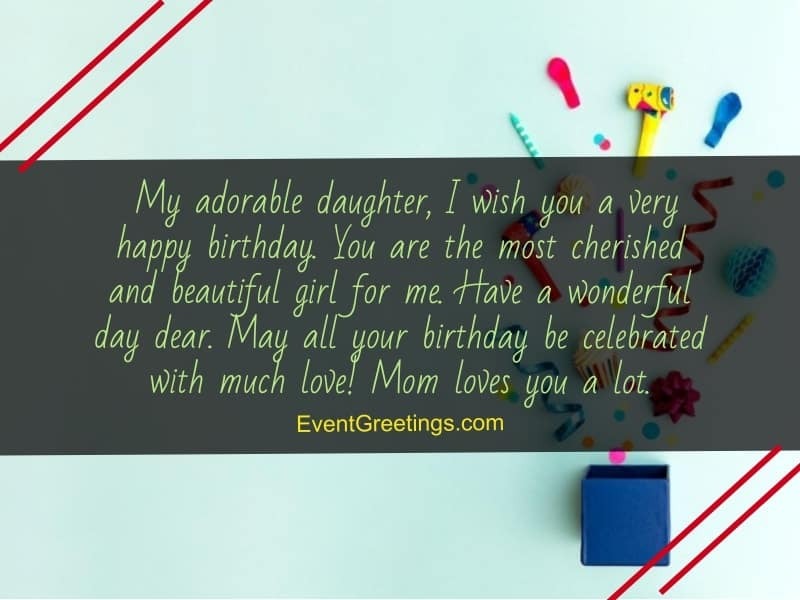 Dear daughter, happy birthday! You know that I love you and will do anything to keep the smile on your face. May God lighten up the road of your life! Have a wonderful journey in life. 31. Happy 18th birthday, my sweetheart! It’s a new stage of life where you’ve to decide many of your big decisions in life. May the Almighty give you strength to overcome any obstacle and always make you the winner! 32. Congratulations my princess for your silver jubilee! You can’t imagine how happy I’m today. You are the best daughter and I wish that you get the perfect life partner soon. 33. Today is a day to celebrate your birthday, my daughter. Happy birthday! Enjoy the day with much joy. May you have a life full of success, wisdom, and love! 34. Happy birthday, my daughter! It’s the first time that you are not with us on your birthday. I wish I could hug you and kiss you. Miss you, my child. Come back soon dear with your desired success. 35. It’s the happiest thing for every mother to see the healthy growth of her child. And the pleasure become unbounded when this child makes you feel proud of their success. I’m so thankful to have a daughter like you. I wish you a very happy birthday, my child! 36. My princess, on this day, a few years ago God has given me the best gift of my life; my little angel. Happy birthday, dear! I wish you to be always happy and healthy. Love you. 37. My baby girl, happy birthday. You’re the most beautiful flower in the garden of my heart. You deserve to have all the love and happiness of the world. Have a joyful birthday. 38. The most awaited day has come. It’s your quinceanera day. May you spend a wonderful day with a lot of warm wishes and love! Enjoy every moment and make this special unforgettable. 39. Happy birthday, princess! You know how much I love you and what you mean to me. Your smile gives me the strength to live. Never feel alone on your way of life. My supports are with you always. May God always shower his blessings upon you! 40. The long-awaited day has finally come. Today is your bat mitzvah day! I am so thankful to God that you’ve grown healthy. My dear, Have a wonderful birthday! Every day, every moment your mom will always accompany you like a shadow. 41. 18 years have passed! Oh my God! My naughty little girl is going to become a woman. All thanks to the Almighty that he keeps you healthy. Congratulations on the independent life. Give your best and work hard to be successful in life. 42. My only child, happy birthday! My lovely doll, thanks for giving me the special feelings of a mother and I pray to God that, one day you’ll also have the same feelings. 43. Happy 20th birthday, my daughter! I’m so happy that, you’ve become an icon for all woman in this age. You have given us the best gift and make us so proud. Always be like this kind-hearted and may all your dreams come true. 44. Today is the day that I can’t ever forget. Happy birthday, my angel! Thanks for making me a proud mother. I may not be a perfect mom but no doubt that you’re the perfect daughter. Love you. 45. My lovely daughter, happy 50th birthday! I’m so happy that I’m still alive to wish you and hug you on your very special day. You’re perfect and wonderful in every way. I pray to God that he bless you with many years of healthy life that you can dance at your grandchildren’s wedding. 46. My little munchkin, happy birthday! Today I want to give you a promise that, no matter what happens in life, you’ll always find your mom beside you. Always fight for your dream and never give up the hopes. God bless you! 47. Thanks to God that, he sent me such a kind and beautiful girl. Happy birthday, my daughter! Enjoy the very special day and have a lot of fun. 48. Happy birthday, my beloved daughter! Sometimes I think that I must have done something very good in my life that God has sent you in my womb. You’re my pride and you’re the reason for my happiness. May God always bless you! 49. Today, my princess has entered into the 20th phase. Congratulations dear! No matter how old you are, I am always here by your side. I love you, my doll. 50. My daughter, happy birthday! I didn’t give birth to you but you made me a mother. After your entrance into my life, I realized how beautiful the mother-daughter relation is. I understood that it is not necessary to have a blood relation for any relation. Thank you for fulfilling my life. Always be happy.